Super Bowl Sunday is almost here, meaning it's time to lock down plans to gather in front of the big screen—whether it's to cheer on your favourite team or take part in the can't-be-missed half-time performance. Wherever you're planning on watching the big game on February 4, it's an opportunity to dress for the occasion. Score some style points with one of these Super Bowl party outfits inspired by It girls who incorporate equal parts sporty and cosy into their casual daytime looks. Work your team's colours into a winter-ready ensemble made for lounging in front of the TV or suit up in your best athleisure look for a cool take on game-day style. 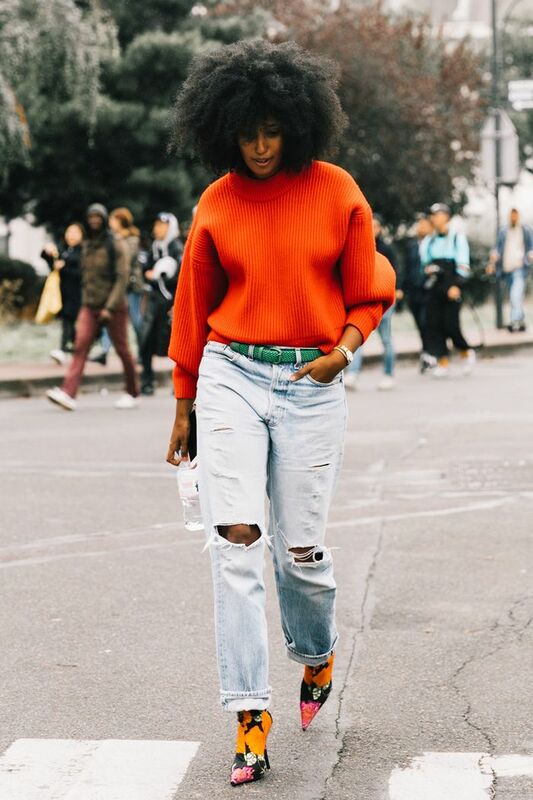 A bold sweater flaunting your team's colors is an easy pairing with boyfriend jeans. Add a pair of playful heels in a coordinating colorway to make your look party-ready. A crisp button-down paired with track pants and white sneakers never looked cooler. Ensure major comfort when you gather on the couch with a ribbed-knit sweater, black leggings, and sneakers. Top off a jumpsuit and sneaker look with a sweater in your team's colors for a distinctive statement. A layered look with an army jacket and a cowl-neck sweater is guaranteed to make a cool statement while keeping you comfortable throughout the whole game. Some eye-catching pants in a fun hue look great with a plain T-shirt and denim jacket. Add some statement earrings for a pretty final touch. For a game-day take on the Canadian tuxedo, don some jeans and a denim jacket and add a T-shirt in your team's colors. Bonus points if you wear matching sneakers. For a super-casual look that turns up the comfort factor, a sporty hoodie looks great with skinny jeans and sneakers. Add some hoops for a party-ready touch. When in doubt, a simple sweater in your team's colors plus your favorite pair of jeans is an easy bet. Again, you can dress up your look with oversize hoops.